The big story when it comes to CPU performance is a look at how the Cortex A15s perform under Android. Unfortunately we're still left with mostly browser based benchmarks to measure CPU performance, which actually highlights a major issue in our testing: Android V8 optimization doesn't seem to be anywhere near as good as it is under Chrome OS or Windows. As a result, all of the Nexus 10 performance scores end upslower than the new Chromebook - despite using the same SoC and running Chrome on both platforms. It's also possible that the Exynos 5 Dual in the Chromebook is allowed to burn a bit more power, translating to better performance, but either way the solution here in the Nexus 10 doesn't look as good across the board. 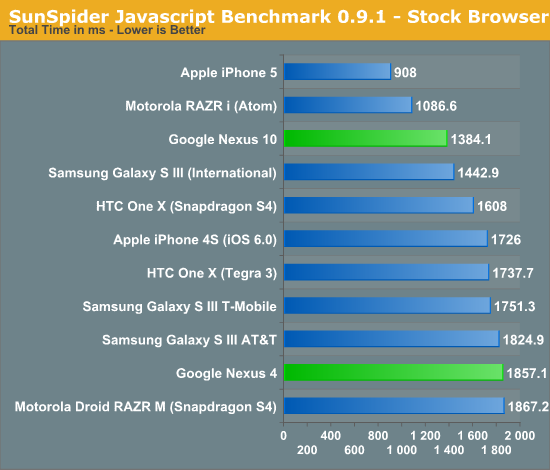 SunSpider performance is good, but not significantly better than Qualcomm's Krait based Snapdragon S4. 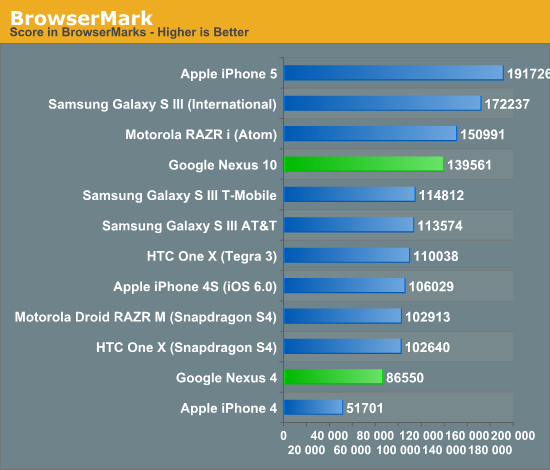 Both the iPhone 5 and RAZR i are able to outperform the Nexus 10. The S4 Pro based Nexus 4 tends to be in line with other S4 based devices - SunSpider doesn't really give much credit to the extra 2 cores. BrowserMark puts the Nexus 10 behind many platforms that should be faster, I'm even wondering here if there's some hard partitioning of memory bandwidth between the CPU and GPU to drive the 2560 x 1600 display that's simply choking the CPU here. The Nexus 4 does ok, but again there seem to be some V8 optimization issues at work here under Android 4.2. At 1.5GHz it should deliver at least the performance of the dual-core Snapdragon S4 solutions. 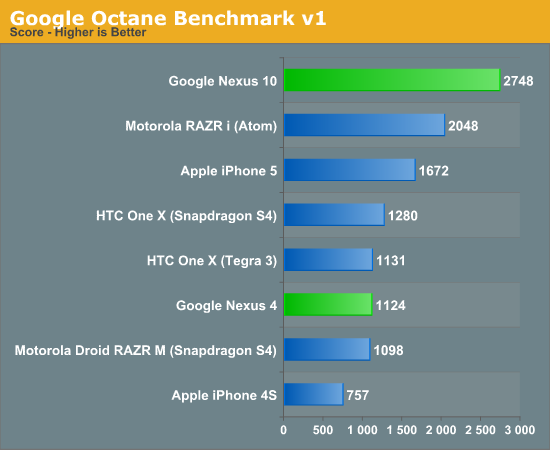 Octane is the first test where the Cortex A15s are really able to flex their muscle - the Exynos 5 Dual based Nexus 10 manages to outperform the RAZR i by 34%, and compared to the A6/Swift based iPhone 5 the advantage grows to 64%. The Nexus 4 performs about in line with other Snapdragon S4 based devices, although once again the extra 2 cores don't seem to be doing much for it here at all. 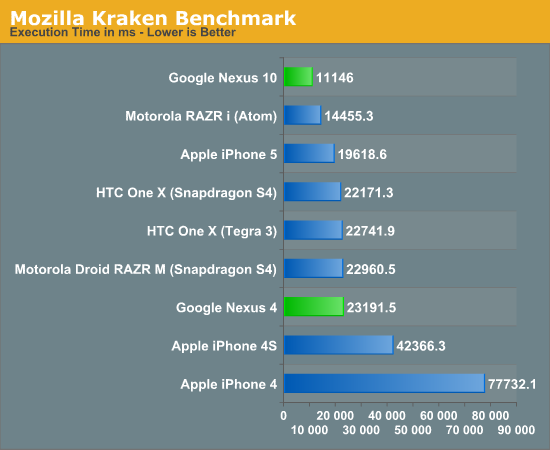 Kraken also paints the Cortex A15 based Nexus 10 in a good light: there's a 30% advantage over the RAZR i and a 76% advantage over the iPhone 5. These numbers will shrink a bit compared to other tablets, but not by much. The Nexus 4, once again, ends up performing similarly to dual-core Snapdragon S4 based devices. Overall, the Nexus 10 results show us some real promise for what we can expect from ARM Cortex A15 based SoCs. The potential upside to this new architecture is huge.